Darien’s charm lies in its details and dimensions. 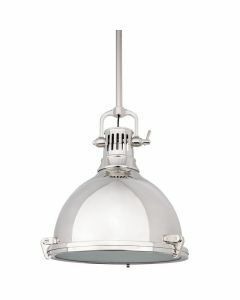 An oversized ornamental swivel, a double-ringed socket holder, and industrial rivets at the top of the shade are a few examples. 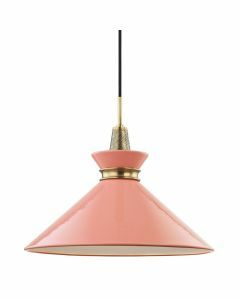 Available with either an opal glass white diffuser or a metal shade, its finish continues on the inside in the latter, adding a distinctive touch. 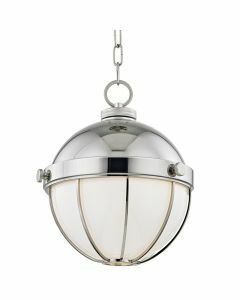 Available in three finishes: Distressed Bronze, Historic Nickel and Polished Nickel. Please select finish from the drop down menu below. It measures 16”H x 11”Dia. The canopy/backplate measures 7”D. The minimum height is 21.75” and the maximum height is 75.5”. It takes (1) 150 watt max, 120 VAC (not included). The socket type is E26 Medium base – A19 bulb. UL Rating is damp. Shade dimensions: 11” bottom x 8.25” height. 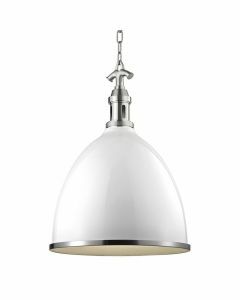 The opal/glossy shade has a socket ring attachment and the material is glass. Ships via UPS. Click on image for greater detail.